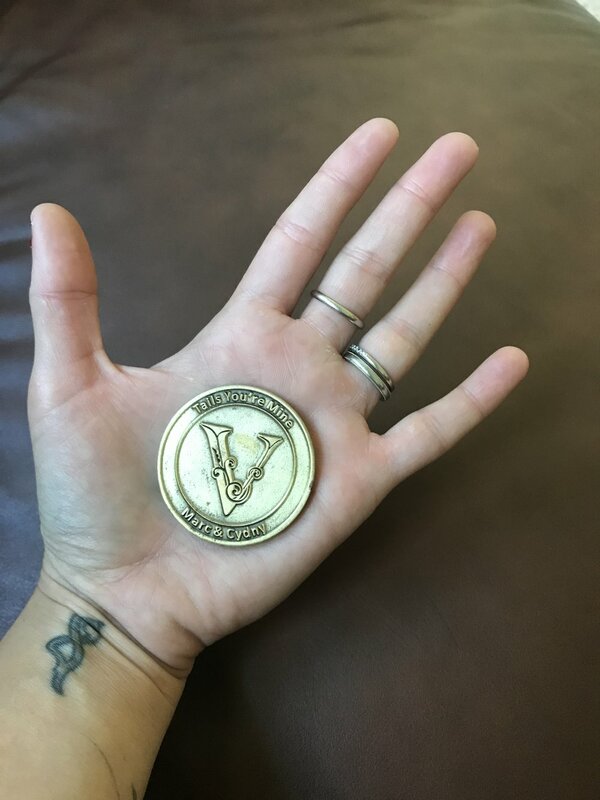 The Power Of The Coin, A V Tradition. Marc and I’s first trip together was on a whim. We just started dating. I want to say it was only a few weeks in, maybe a little over a month. Right at the peak of the complete infatuation stage where you become inseparable. Marc had plans to travel with his mother to visit his brother and sister-in-law and mentioned that I should come. I repeat, mentioned. I didn’t think he was quite serious, but typical me, I didn’t think twice and booked my ticket. Family vacation, I’m in! I’m sure his family was surprised, but I wasn’t going to miss a chance to see California. Okay, and be with Marc too. I had booked a 3-day trip to quickly visit and then get back to the daily grind. Marc was staying the week. Our love for each other definitely grew fast during this trip. My last day we took the 2-hour drive down the windy, scenic, Highway 1 from Ventura to LAX. The gloomy aura of impending separation that filled the car could have been cut by a knife. It was evident we didn’t want to part each other. Oh young love, even though he would be back in a few days, it wasn’t enough for us at that time. As we got closer to LA we did a pit stop at a local cafe to stall on time. Marc grabbed a coffee and a snack as I paced waiting out by the car. “Do I say, I want to stay longer?” circled in my head. “Oh Cydny, that is ridiculous why pay for another flight for a few more days…..” says the devil on my shoulder. In hindsight it was more like the angel on my shoulder. So what do we do now? Do I cancel my flight? Do I call out of work? Do I stay or do I go!!!??? Ugh! The decision was so hard. I was pretty sure I was out of my mind to even consider this. Well, that’s simple enough. I’ll let the universe tell me what to do. One flip in the early Cali sun, a peek under my palm, and it landed heads. HEADS HERE! Just like that, we hopped back in the car, drove to Venice Beach, sat toes in the sand and planned out what to see and do next. Happier than ever. From that day on a tradition was born. When decisions got tough, we flipped. Do we eat here or there? Flip. Do we go left or right? Flip. We trust the universe and allow it to help us choose our adventures. One flip, one answer, and we go.